More than 16,000 people are thought to have been displaced by floods following heavy monsoon rains in Myanmar, also known as Burma. 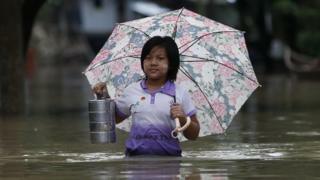 The flood began at the weekend and worst hit the country's eastern Kayin state on the border with Thailand. Large areas have been evacuated and people were moved to shelters to wait for the waters to subside. The summer monsoon has brought heavy rain across most of Southeast Asia, the Philippines and Japan. According to the Myanmar Times, residents of the state capital Hpa-an say that while each year there is flooding, this time things are much worse. More than 10,000 residents of the city had to leave their homes. The extreme flooding comes just days after a burst dam in Laos flooded several villages leaving many dead and hundreds more missing.